Representatives of the Tenth Annual Walleye Ice Fishing Tournament presented a $1,000 check, as well as $445 from a special raffle raised by event co-coordinator Lou Stutzke (Owner of Fuel-N-Food of Mayfield), to the Great Sacandaga Lake Fisheries Federation for fish stocking this fall. The Walleye Challenge this year was held on held on February 17 on the Great Sacandaga Lake. 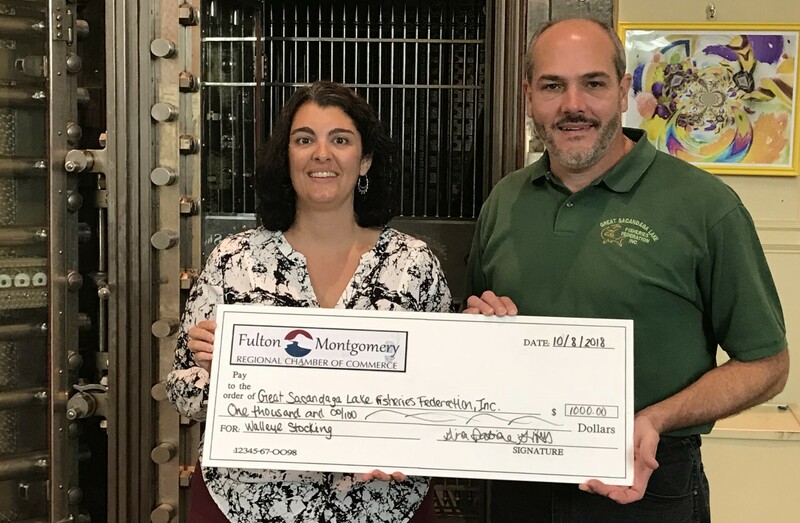 Director of Tourism, Gina DaBiere-Gibbs, presented the check to Randy Gardinier of the Great Sacandaga Lake Fisheries Federation at a recent ceremony at the Fulton Montgomery Regional Chamber of Commerce. 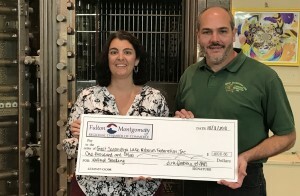 The tournament registered 1750 fishing enthusiasts with approximately 54% of the registered participants from outside of Fulton County representing ten states outside of New York: Connecticut, Kansas, Maryland, Massachusetts, Minnesota, New Hampshire, New Jersey, North Carolina, Ohio, and Virginia. The event has sold out in each of the ten years it has been held. The 2019 Walleye Ice Fishing Tournament is scheduled for Saturday, February 16, 2019. Anyone interested in adding their name to the event’s mailing list is asked to call the Fulton County Tourism Department at (518) 725-0641 or to send a request via e-mail to tourism@fultonmontgomeryny.org.